TMAC Resources Inc. ("TMAC" or the "Company") announces that high-grade gold has been drill intersected at depth below the dyke at the Doris Deposit during the Company's ongoing underground drill program at Doris, located in the northern part of the Hope Bay Property, Nunavut. Dr. Catharine Farrow, Chief Executive Officer of TMAC, stated, "The drill results published today demonstrate that the high-grade gold bearing quartz veins and structures that are in our current mine plans are not truncated by the 75 metres to 100 metres thick, un-mineralized diabase dyke that exists from approximately 100 metres to 200 metres below surface. 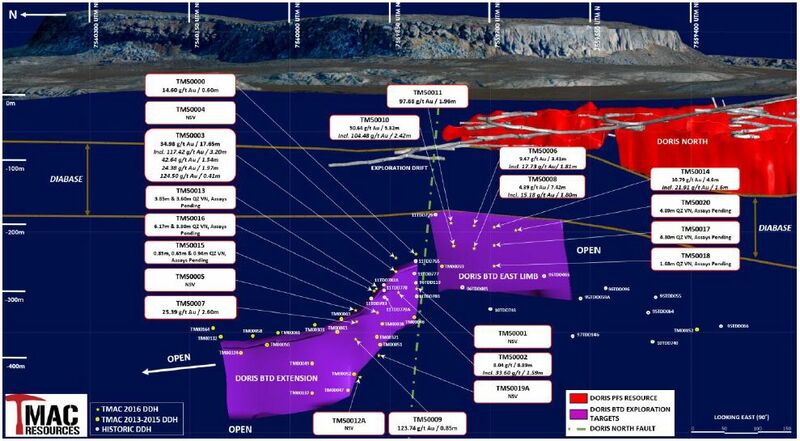 The current known high-grade reserves and resources at the Doris North Hinge Zone (Measured and Indicated Mineral Resources of 550,000 tonnes grading 20.2 g/t Au and containing 358,000 Au oz.) 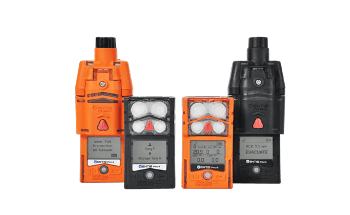 are currently only defined above the diabase dyke and only to the shallow depth of 160 metres. 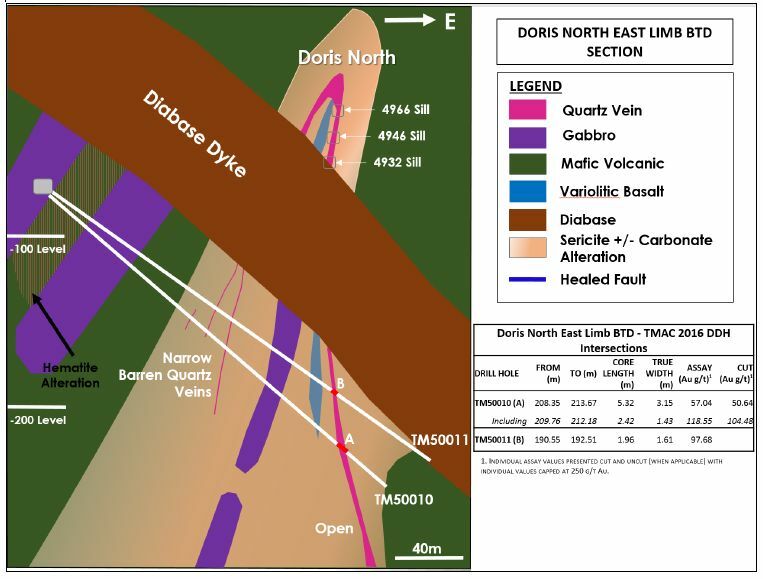 Today's drill results along with historical drill results in this area demonstrate that the Doris high-grade gold bearing structures occur below the current shallow depths of the Doris reserves (surface to 150 metres below surface). We are excited by the initial results of our underground drilling program as we begin to explore and define mineralization on the Doris Deposit below the diabase dyke. Management believes these results could significantly expand the current five year mine life at the Doris mine and dramatically affect the global reserves and resources and annual gold production at Hope Bay." Dr. Farrow added, "Completion of the exploration drill drift in the first quarter of 2016 allowed the drilling of exploration targets below the dyke with shorter, better oriented diamond drill holes than from the historical surface platforms. As a result, we have been able to identify at depth what is interpreted as the extension of the structures and alteration package that host the gold-bearing veins at shallower levels above the dyke at Doris. These structures contain the gold mineralization intersected this spring and reported today. In conjunction with pre-production development and mining, we have begun work on our longer-term goal of sustaining long-term production at the Doris deposit by adding mineral reserves and resources efficiently as underground access to the ore deposit and drilling platforms are developed. Our success has allowed us to aggressively plan for the potential extension of underground infrastructure and production below the diabase dyke at Doris." The primary objective of the 2016 underground exploration program is to build on the existing Doris mineral resource base and continue to define mineralization below the diabase dyke. The current drilling program is focused on the Doris North BTD zones, following up on significant mineralization intersected in widely spaced drilling during previous drill programs from surface platforms. Underground exploration drilling commenced late in the first quarter of 2016, from the underground exploration drift developed during the fourth quarter of 2015 and first quarter of 2016. The exploration drive has provided drilling platforms necessary to effectively test high potential targets beneath the diabase dyke. Historical drilling that targeted this area has been limited due to few surface drilling platforms available to adequately drill from Doris Mountain, north of the Doris camp infrastructure. If continued drilling is successful in defining an economic resource below the diabase dyke, the current exploration drive will be used to begin the access ramp. Figure 1: DORIS NORTH BTD TARGETS (LOOKING DOWN OBLIQUELY AND TO THE SOUTHEAST). TMAC completed three holes (see Table 2, TM00303, TM00321, TM00424, previously reported) in 2015 that intersected the Doris North BTD Extension from surface drilling platforms. The holes intersected quartz veins with high grade gold mineralization and, together with historic drilling, confirmed that Doris North mineralization continues to the north below the dyke (Figures 2 and 3). The underground drilling reported here has further refined the geological model and continues to intersect significant high grade mineralization. Figure 2 is a longitudinal section along the plane of the mineralized zone showing locations of current and historical drilling. Figure 3 is a section through the BTD Extension zone illustrating quartz vein geometry similar to the Doris North Hinge Zone above the diabase. Quartz veining and gold mineralization are concentrated within dilatational zones at the margins of a large gabbro unit hosted within a mafic metavolcanic rock package. Highlights from the Doris North BTD Extension include drillhole TM50003 at 35.0 g/t Au over 17.7 metres and TM50007 at 25.4 g/t Au over 2.6 metres. All results from the current drilling program on the Doris North BTD Extension zone are presented in Table 1. Table 2 is a summary of historical drilling within the zone. The Doris BTD Extension remains open at depth and along strike to the north. 1. 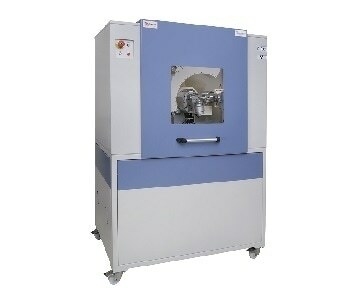 Individual assay values presented cut and uncut (when applicable) with individual values capped at 250 g/t Au. NSV = No significant values. 1. Down-hole thickness; true width varies depending on dip of the drill hole. Drill holes were designed to intersect quartz veins at as close to a perpendicular orientation as possible therefore true widths are approximately 55% to 75% of down-hole widths. 2. 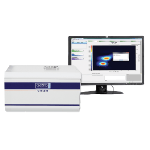 Individual assay values presented cut and uncut (when applicable) with individual values capped at 250 g/t Au. 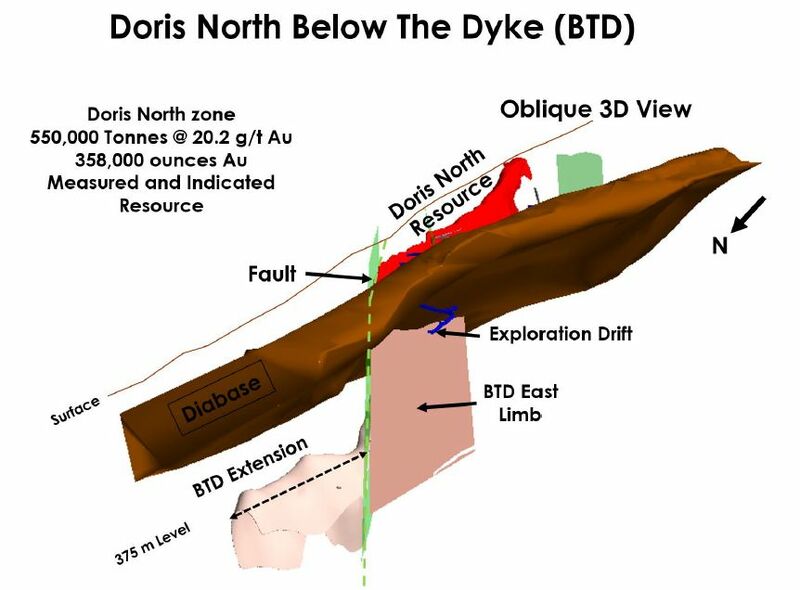 Figure 2: DORIS NORTH BTD Longitudinal Section showing the location of current drilling. 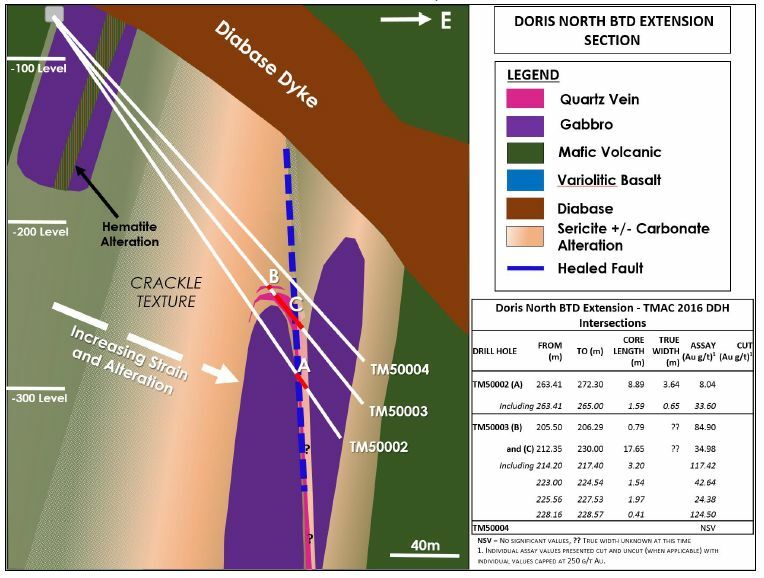 Initial results of the 2016 drilling on the Doris North BTD East Limb have confirmed the continuity of the East Limb quartz vein beneath the diabase dyke. The mafic metavolcanic host rock package alteration (sericite and carbonate) and fabric development that are characteristic of the gold-bearing quartz veins above the dyke continue at depth. The dip of the East Limb below the dyke, however, is steeply east compared with steeply west above the diabase dyke. All drillholes targeting the BTD East Limb during the current program have intersected the East Limb quartz vein and have returned significant gold assays as summarized in Table 3. Table 4 summarizes historical diamond drilling results on the Doris North BTD East Limb target. Figure 2 is a longitudinal section along the plane of the BTD mineralization that illustrates the locations of current and historical drilling. Figure 4 is a west-east cross section, looking north, through Doris North BTD East Limb, showing the extension of the East Limb quartz vein below the diabase dyke. Highlights from the current drilling include drillhole TM500010, which intersected 50.6 g/t Au over 5.3 metres, including 104.5 g/t Au over 2.4 metres, and drillhole TM500011, which intersected 97.7 g/t Au over 2.0 metres. Little historical drilling has been completed on the East Limb in the vicinity of these new intersections due to a lack of appropriate surface platforms. The Doris BTD East Limb mineralization is open along strike and down-dip. The current drilling is designed to provide enough information to define an initial mineral resource estimate on this zone and bring the BTD East Limb into the Doris deposit mineral resource base. Table 3: Doris North BTD East Limb 2016 diamond drilling intersections.